Accountability can make you do some crazy things. Two weeks ago, the house church that meets in our home discussed accountability. In order to make it practical, I challenged everyone to try and pray with someone, preferably who doesn’t know the Lord [Jesus] during the week, and said that we would report back the next time we came together. Big mistake! Having challenged everyone, I now needed to live up to it too. Since I live the life of a writer, most of my time is spent with just me and my computer. There was no obvious situation where I would come across someone new, so I brainstormed. I put an ad on Craigslist. “Do you need prayer?”: no response. I responded to some tweets that said, “I need prayer” or “I need God”: no response. When our group came back together, everyone had a story of how they had deliberately prayed for someone. No one they approached had refused prayer; everyone was very grateful. Would we have done it without the knowledge that we would be asked to report back? I don’t think I would have done so. Prayer and accountability is a key tool in multiplication. Practical activity: Give your group a challenge. Maybe challenge them to pray with someone, or to tell their story to a not-yet-believer. The important thing is that you follow up with it. Categories: HOUSE CHURCH, PRAYER | Tags: Accountability, Church, Evangelism, god answers prayer, Home Meetings, House Church, Messiah, PRAYER, Religion, spirituality, tweets, Witnessing about Jesus Christ | Permalink. A Prayer of Forgiveness: “Father God: I come to You today in Jesus name. I give You everything that has hurt me. I give You every loss and the pain I have felt over each one. I give You injustice, every unfair situation, everything I don’t understand. I give You the people who have hurt me. I give You my past. I give it all to You, and I let it go right now. I ask for the comfort of the Holy Spirit to come into my life. Comfort me, oh Lord, the only way You can. Forgive me for running to people and getting angry at them because they could not make me feel better. You are the only one who can make me better. I thank You, Lord for healing. I ask that the grieving process take its proper course in me and that You would show me when it’s time to go on and how to do so. I pray for my joy to return, and for my life to return. I commit to You to get up and go on. In Jesus name, Amen.” – From Cindy G.
Josie Jager likes this on our Facebook page. Categories: PRAYER | Tags: Prayer of Forgiveness | Permalink. 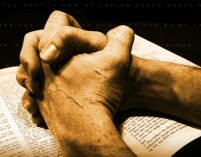 Categories: PRAYER, Prayer Requests | Tags: PRAYER, Prayer Ministry, Prayer Requests | Permalink. Please pray that God will soften by husbands heart. My husband and I are separated, and it has now been over 3 months. He has never forgiven anything I have ever done wrong, not even small mistakes from over 27 years ago. He holds anger towards me and punishes me, and lies a lot. Please pray that God will make him see how much I have changed for him over the years. Please pray for forgiveness, honesty and a loving reconciled marriage; of the letting go of past hurts for both of us. Thank you. Categories: Prayer Requests | Permalink. Please pray for Bethina’s brother, Frederick. Bethina said he had to be rushed to the hospital (TX) due to severe chest pains. He is in the emergency room now, and is coherent and able to talk. Also, he and his wife are going through a separation and they have two small girls (ages 2 and 3). He is asking my husband and me, along with my sister, to take the children. Please remember our ministry in your prayers; that God would send us volunteers to help out with the work He has called us to do, and that we may be faithful in proclaiming the Good News gospel of Jesus Christ; that many souls might be saved through our ministry and that the hearts and lives of believers will be edified. 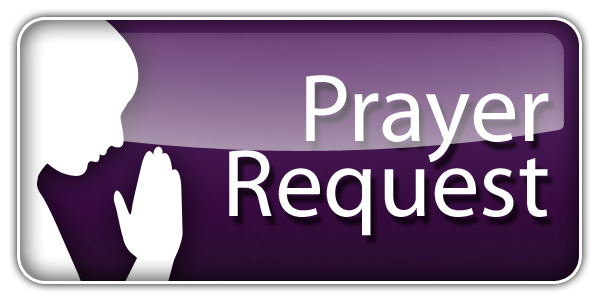 Categories: Prayer Requests | Tags: Prayer Requests | Permalink. I have three friends of mine who live with constant pain and I’d really appreciate if could pray for them. Mary, Doug, and Mike are their names. They pretty much live with pain 24/7, but they usually don’t talk much about it, so I have to ask specific questions if i really want to know how they’re doing. I have a friend who’s co-worker’s son just died, which was kind of a shock, since he was only 33 years old. I’m praying for God to comfort the family. I’m not sure where they are spiritually, but thanks again for your prayers. James Andrew, Reyna, Leonore and Adolfo, Carolina, Margarita. 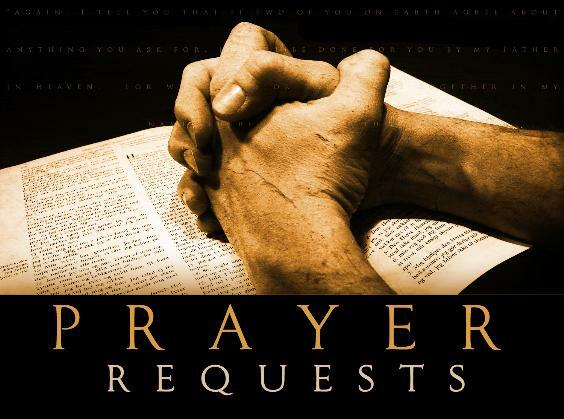 Categories: Prayer Requests | Tags: 1-17-11, Prayer Requests | Permalink.